CHONGQING - It now takes about a week to transport goods between Singapore and Chongqing but the two cities hope that this can be reduced to as little as five days, easing the import and export of fresh produce for instance. To realise such time savings, information about cargo can be sent ahead of time to minimise customs delays, suggested Minister in the Prime Minister's Office Chan Chun Sing, who is on a visit to China until Saturday (April 14). He was speaking to the Singapore media on Thursday evening after a day of meetings in the south-western city with local party and government leaders, as well as Singapore and Chongqing businesses to discuss the Chongqing Connectivity Initiative. The third Sino-Singapore joint government project aims to drive trade and investments in China's less-developed western region through better transport, financing and data connectivity. "Beyond the physical connectivity of linking the road, rail, river and sea, we also need an information network to facilitate such trade flows," Mr Chan told reporters. Putting things in perspective, he noted that the new Southern Trade Corridor linking Singapore, South-east Asia and western China via rail and sea has already cut freight time from the three weeks via a route going through the Three Gorges Dam and Shanghai. Said Mr Chan: "So we already save two weeks. We challenge ourselves and ask ourselves, 'Can we save even more time, save even more costs?'" 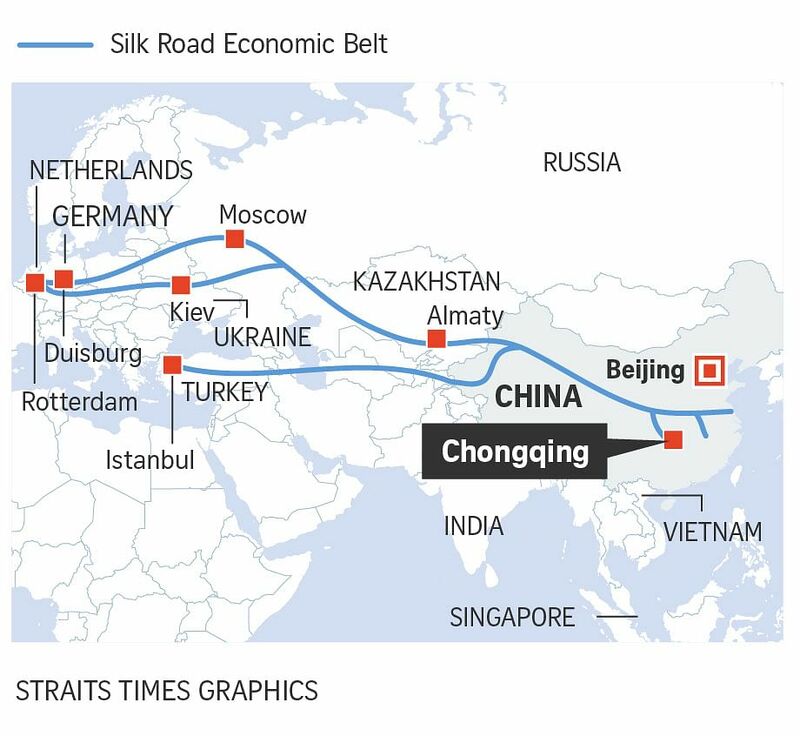 While the new trade corridor enables goods to be moved between Chongqing and Singapore in less than five days, said Mr Chan, actual freight time is a week or so, as a result of customs delays. To solve this problem, information about goods in a container can be sent before it physically arrives at the port to facilitate customs clearance, suggested Mr Chan. This can be done by setting up a single electronic window to facilitate information sharing. Ultimately, improving connectivity is about creating more business opportunities and jobs, Mr Chan noted. The Southern Transport Corridor is not limited to transporting goods from southern and western China through Beibu Gulf to Singapore. It is also a conduit for goods from South-east Asia to go through Beibu Gulf all the way up to south-western Chongqing. "So the next phase of our conversation is to find out the products that will be the most suitable for this new route," he said. Mr Chan said his assessment is that momentum around this new transport route is gradually building, with more people wanting to use it. Besides neighbours Guizhou, Gansu and Guangxi, Chongqing is in talks with four other provinces - Sichuan, Shaanxi, Yunnan and Qinghai - to explore how to work together to develop the route. "The beauty of the Southern Transport Corridor is exactly this - the more people use it, the cheaper it will be, the more efficient it will be... and then it will in turn encourage even more people to use this network going to the south," said Mr Chan. To this end, Singapore will gather Chongqing and its neighbouring provinces as well as other Asean countries for a forum in the Republic in August to explore the potential of the new route. On Friday, Mr Chan will meet Gansu Governor Tang Renjian in Lanzhou to discuss the province's participation in the Southern Transport Corridor. He will also meet Sichuan party boss Peng Qinghua in Chengdu after his visit to Gansu.